Continuing my goal of reading a book a month, though I might be a little behind schedule - I chose to read J.D. 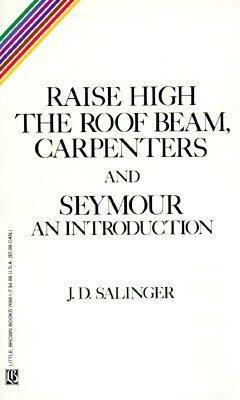 Salinger's Raise High the Roofbeams, Carpenters and Seymour: An Introduction as my book(s) of March. I've mentioned J.D. on this blog before, and I'm definitely not afraid to go out on a limb and say that he is without a doubt, one of my favorite authors. I know a lot of people get turned off by his prickly reclusive demeanor, but I try not to take his personality into account when reading his work. I have read all of his other major works, starting with Catcher in the Rye, then Franny and Zooey, followed by Nine Stories - beginning with Catcher my Junior year of high school, and working through the latter two books my freshman and sophomore year of college. I can't tell you how many times I read the first 25 pages of Raise High the Roofbeams, Carpenters before setting the book down feeling completed uninterested in the discussions of Taoism, family matters, and the Glass family (though that's not to say I'm not completely enamored with the Glasses). I opened this book with complete determination to get through it - and was so pleasantly surprised by how much enjoyment I got out of Raise High. It was almost as though all of the years of college I worked through, the East Asian Philosophy course, the countless art history classes, the English literature courses all adequately prepared me for a complete reading of this book, making it an overly enjoyable experience. I'm not going to glaze things over when it came to Seymour an Introduction which I had a really hard time getting through. I understood parts of it, and generally enjoyed that it was a story about a writer writing a story, and it was all so very post-modern and self-conscious, but for some reason I just couldn't get into it. I did finish it, and I'm happy I got through it, but for now, I'm going to stick to my sincere love of Nine Stories and Franny and Zooey, and leave it at that. I love JD Salinger. His voice has always been really honest to me even when his characters aren't. When I first read Catcher in the Rye back when I was 16 I couldn't connect to it at all, but I knew I appreciated Salinger's writing style so I kept delving into his work. I read F&Z and Nine Stories after my freshman year and was enamored with both. The characters felt real even when they spoke with affectation and the meditations on Eastern religion were fascinating. I especially love the ideas in "Teddy." I had to reread Catcher for my American Coming of Age Novel course this semester and liked it a lot more. Once you're no longer Holden's age, he becomes a lot more sympathetic as the lost boy. I wrote a really intriguing and fun paper on him about his particular voice/narration and its attempt at authenticity that could never quite be reached because his language was the same as the phonies. Sorry to bore you, basically I love Salinger and need to read this. Oh and I see you're reading Other People We Married. That was my first "pleasure reading" book of the summer and I really liked it. Her stories are honest and focus on the quotidian struggles we all have. Nothing sensational happens but that's why its so good because she can capture normal problems. Let me know which stories you like. I especially loved reading them late at night before I went to bed or early in the morning after I got up. Puttanesca was quite good. My other favorites were "Fly Over State" and "Some People Must Really Fall in Love"- go figure they're all about lonely women so I can relate too. If you like Straub, then try Lorrie Moore. Straub studied under her at the University of Wisconsin MFA program and you can definitely tell the influence. Moore's stories are also about lonely women and have really sharp observational wit. Try Birds of America, her most well known short story collection.